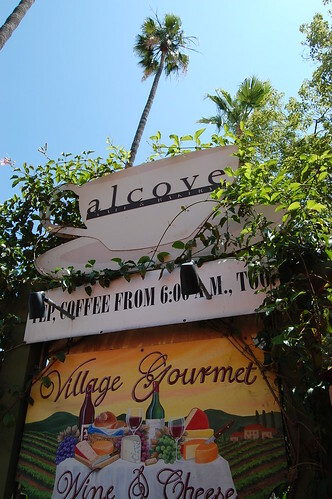 I met the Joy Luck Club for brunch at Alcove Cafe & Bakery today. It's a cute little place that gets quite hectic on the weekend. You order your food, and then you find a table in breakfast-egg fashion. You scramble. Please stop groaning. But the food is good and the ambience relaxed and even somewhat darling. I sipped my fresh-squeezed orange juice, as my cohorts shared stories of house-hunting, grad school, babies, and unruly five-year-olds who bite. My shrimp and lobster omelet ($15.95) was delicious after I doused it with Cholula Hot Sauce, the "flavorful fire that's perfect for any food." 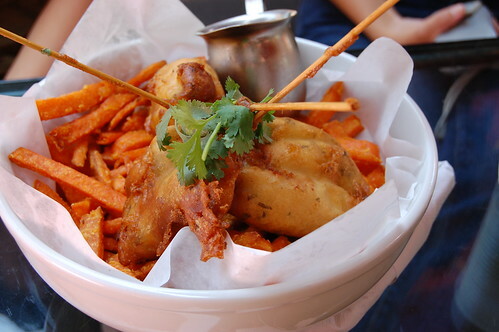 The fish and chips ($15.95) looked fantastic, and I can personally attest that the sweet potato fries (i.e., the "chips") tasted as fantastic as they looked. 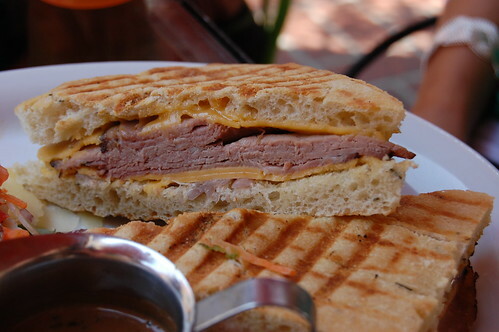 The panini at our table with prime roast beef, aged Vermont cheddar, caramelized onions and horseradish mayo ($11.95) looked meaty and scrumptious. 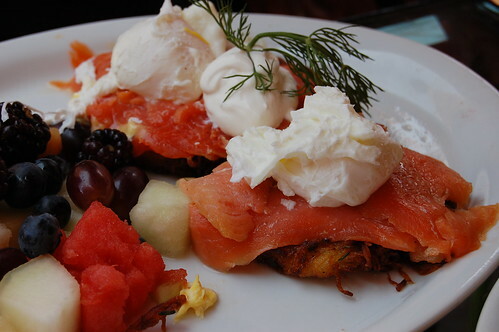 The most interesting meal of the day was the smoked salmon breakfast stack ($12.95), which was comprised of two potato pancakes topped with smoked salmon, poached eggs, creme fraiche and fresh dill, served with seasonal fresh fruit. My taste-test bite was quite yummy. Then there was our very patriotic dessert -- a red velvet cupcake ($4.50) (!!!) 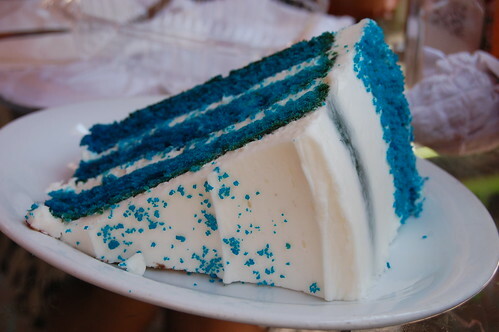 and an enormous slice of blue velvet cake. Yes, blue! The red velvet cupcake was decent. Fairly moist. Solid consistency. Tasty cream cheese frosting. It didn't merit the steep price tag, though. With regard to its blue velvet, Alcove urges you to "try this original twist on the classic red with vanilla buttercream instead." We couldn't pass it up. How often do you get to eat bright blue food, aside from Icee and Powerade? Sadly, blue is not, in fact, the best twist on the classic red. We all agreed that the buttercream was too sweet, and the cake was crumbly and drier than the red velvet cupcake. This made me...blue. I hear you groaning again. Stop it. Even sadder than bad blue cake was parting, though. I spent a delightful three hours under an umbrella in the sun, laughing with my dear cohorts about a judgmental Wii Fit, a neighing horse witness, and one husband's penchant for Hong Kong cafe-style food. I really didn't want to leave. I was excited, however, to go home with a little gift in hand. Perfect ending for all the food I ate. 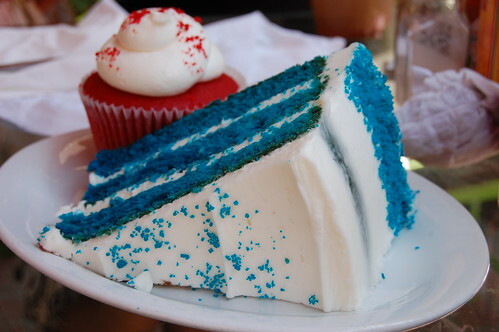 Blue cake?? Hmmm. The salmon dish looks pretty darn good, though! Is that a save the date flossing toothbrush? 'twas fun. SO SO sad i had to jet early...to work. bah. :(. sounds like i missed some fun and dessert. thanks for choosing a lovely spot, again. p.s. mama camera takes nice photos. oh, please report on the status of your bloopoo tomorrow. TIA! that blue cake is just wrong. The food looks yummy! I think they shot an episode of 6 Feet Under there? Joy Luck Club. Ha! Love it. And the panini was roast beef which was quite tasty, but next time, I'm all over that lobster omelet. 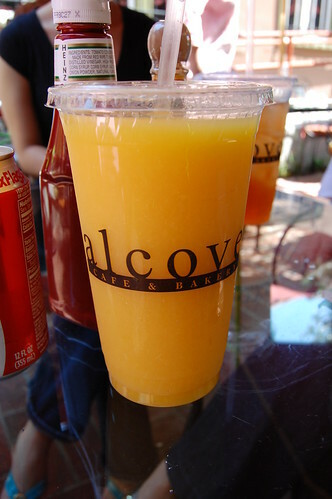 i looooove alcove and am there pretty often. 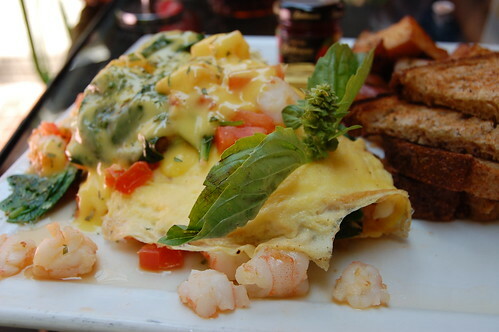 i ALWAYS order the shrimp & lobster omelette; great choice! i also get a large, iced "virtual buddha" or "mind over muddle" herbal/fruit drink from the elixr bar. yum! p.s. 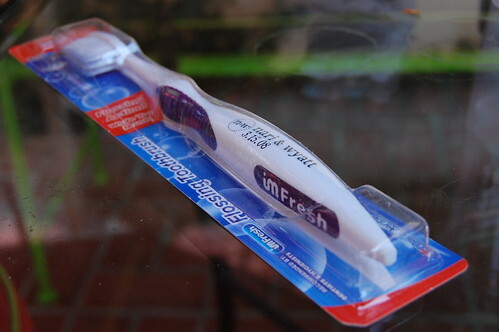 love the toothbrush; i recognize it! What a great brunch - and I don't need a blue poo update, but I'd love to be there for when you brush and spit. JealouE. Love the toothbrush. That is one expensive cupcake. 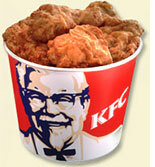 Love your food pictures! blue velvet???? ah, i wish i could try it! Am i the only one who thought the blue cake looked delightful? I'm still sad that I was defeated by the fish. you should chuck it all and be a food stylist. I'm with mboc - that cake looked good to me. And the rest of the food pics made a little bit of spit come out of the side of my mouth just now. My first visit to your blog - very cool. 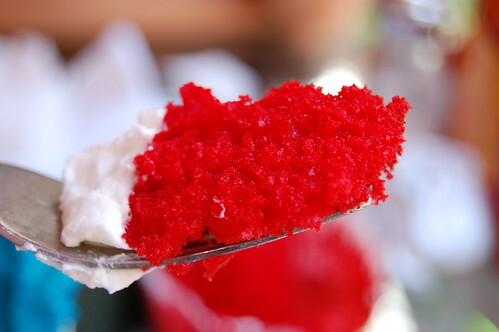 My curiosity peaked on the red velvet cake - the post on our blog for today. The blue - doesn't do it for me at all. 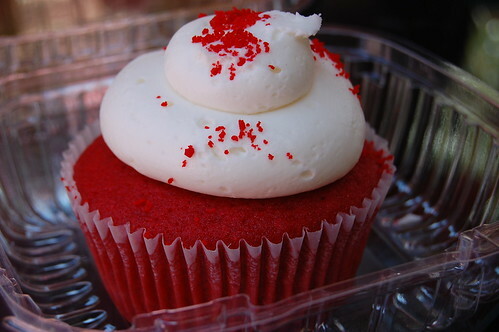 The cupcake - I just think red velvet is made for the cupcake and not so much for the cake. I found it just so so although others raved. Definitely stay away from Milk's (Melrose & Beverly) take on the Blue Velvet - blueberry madness in the worse possible way. 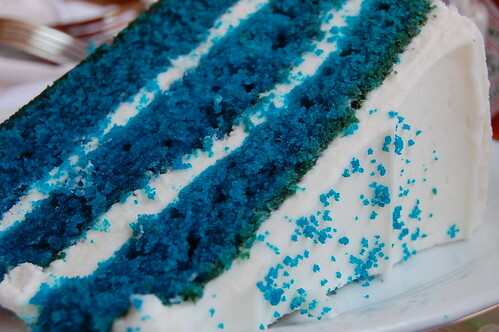 I stumbled on your page when I googled Blue Powerade mix and I have to say... that blue velvet cake looks delicious, I'm sad that it wasn't quite as good as the regular red velvet cake!